Within the blink of a bleary-eye the dizzying 3-day event for Star Wars fans was over and I was left in joyful delirium after meeting two childhood heroes: Luke Skywalker and Princess Leia Organa. Star Wars Celebration Europe was, easily, the best convention I've attended in my lifetime. Filled with fellow fans, of all ages from around the world, having a blast within an 'inclusive environment' (to quote Danie). Strangers united by George Lucas' creation. 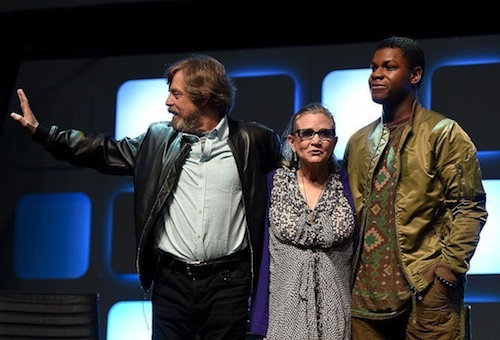 Star Wars Celebration Europe began inauspiciously with the news An Hour With Mark Hamill was filled to capacity, despite arriving 3-hours earlier with a medical badge, amidst controversy surrounding the issuing of wristbands to ticket holders who had paid months in advance. However, it went into hyperdrive with myriad cosplayers (was that Daisy Ridley undercover as Rey?) and a show-stopping FX masterclass from ILM's John Knoll and Doug Chiang, which looked back at the original and prequel trilogies, The Force Awakens and included tantalising Rogue One teasers. There were possible spoilers too. So, be warned. Rogue One cast member Jiang Wen revealed Donnie Yen's character, Chirrut Imwe, dies and Carrie Fisher inadvertently confirmed Han Solo's funeral for Episode VIII. The latter has been mooted for sometime. I was fortunate enough to attend several of the Celebration Stage panels, hosted by Warwick Davis, with thanks to my best friend. Anthony Daniels, Without Protocol, Carrie Fisher: The Princess Diaries and the Future Filmmaker Discussion & Closing Ceremony. John Boyega (Finn), Mark Hamill (Luke Skywalker), Carrie Fisher (Princess Leia) and Alden Ehrenreich (young Han Solo) on stage with Lucasfilm president Kathleen Kennedy and directors Rian Johnson (Episode VIII), Phil Lord and Christopher Miller (untitled Han Solo movie) to rapturous applause and a standing ovation! No, you're crying. Serendipitous encounters with friends old and new, humour, duels with the dark side, a kiss from a princess, a hug from a Jedi and tears of joy. It's not everyday you meet childhood heroes who turn out to be amazing in person. The Force was (very) strong with this one. More please. Were you at Star Wars Celebration Europe? Let me know in the comments below.